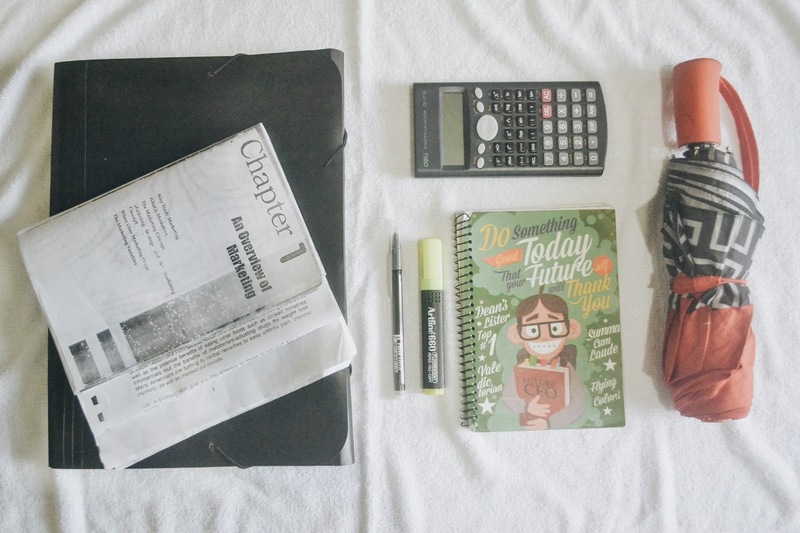 Today I'm going to show you what's in my school bag since holiday break is gone and school just started again. As a college student I only bring stuff that I need and I try my best to bring as minimal as possible. 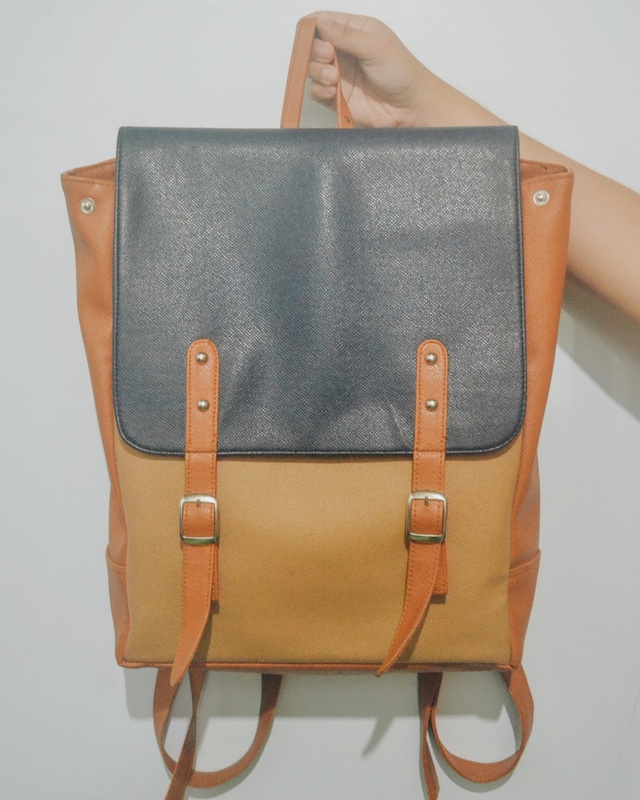 I don't want to stress out carrying a heavy bag full of unnecessary junks in the middle of the day in school. So, here are the things I bring to school for the second semester. Cellphone: Everyone knows how important to staple our phone in our bag. It's simply a must. School ID: In our school, ID is strictly required because basically we can't enter the campus without it. So it's always inside my bag, I mean it, because when I've already enter the campus, I put my ID back into my bag right away. I don't know why but I don't like wearing ID. 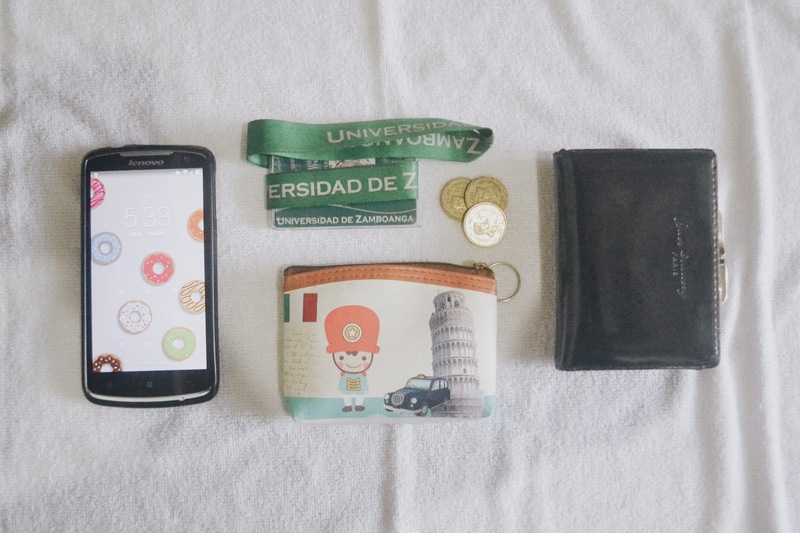 Coin purse: Here in the Philippines, college students use coins more than anyone, for commute, for photo copy of hand-outs/lessons. So I need to have a coin purse to separate the coins from paper bills because it's too stressful to have both in just one wallet. I just can't. Wallet: I keep things like my ATM card, other IDs, bills, polaroid photos, school permit, and different cards that are useless but I still keep them anyway. Just for littles. File folder: As a college student, we tend to photocopy a lot of papers/hand-outs, I mean A LOT. So file folder is a must, for you to be more organized instead of seeing your papers scattering all over your school bag. We don't want that. Notebook: Self explanatory, every student owns notebook or notebooks. But I prefer having only one notebook for my lectures, since I photocopy most of my lessons, sometimes my notebook becomes useless because I don't write a lot in it. I'm used to writing extra information of the lesson on my photocopy itself. So just piece of advice: If you don't write useful stuff in your notebook, just don't buy any or have only one. It'll give you less stress. Pen & Highlighter: One pen, do you know why? Because if I have lots of pens, I usually lose it, and when I only have one, it tends to stay with me, until the ink is gone. It's funny, but true. Actually highlighter is prohibited in our campus, to avoid vandalism. In order for it not to get confiscated, I put it in my pocket when I enter the campus then put it in my bag when I arrive in my classroom. I love highlighters, it's a lifesaver especially when I'm cramming. Calculator: Who doesn't have a related to math subject? None. So I have to bring it everyday to avoid faffing over multiplication, haha. Umbrella: Since I'm in the Philippines, a tropical country, umbrella is a stay put in every students bag. Because we're Asian and we don't like getting tans, we want fair skin. 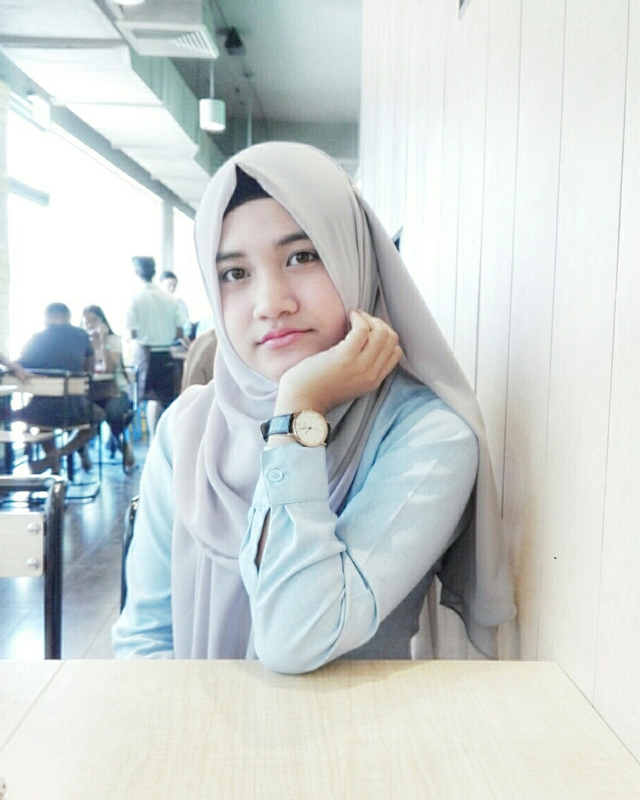 Before anything else, I don't wear make-up even though I'm already 17 in college. I love my face, I don't think it has lots of imperfection. I just can't handle the stress of putting make up on my face, but I shall do in the future. Plus, I only wear lipstick. This is "my hygiene kit". Lipstick: Light pink is the color of my lipstick, because I just want to keep it natural and not too heavy. Lip balm: I'm not a big fan of chapped lips, so lip balm will always be my staple in my any type of bag. Which all girls should do. Baby powder: As I've mentioned, I live in a tropical country, so sweating is natural and baby powder is girls' best friend because it keeps us fresh. Alcohol/Sanitizer: This is everyones lifesaver when we accidentally touch dirty, dusty, sweaty stuff. Eww. Moisturizer: Since I don't wear make-up, I can freely put moisturizer on my face and put some powder then feel fresh after. Efficascent oil: This might be funny, but I love ointments. I don't even know why most of young people doesn't like the smell of it. Girls, it's menthol. It helps me feel relax when I'm panicking or overthinking or stressing over stupid stuff in school. I hope this blog post helped you in some way. So what's your major staple in your bag? Comment it below. Peace be upon to you Fads! Since I'll be entering sixth form, I probably won't bring bundles of books like I used to back then in high school. 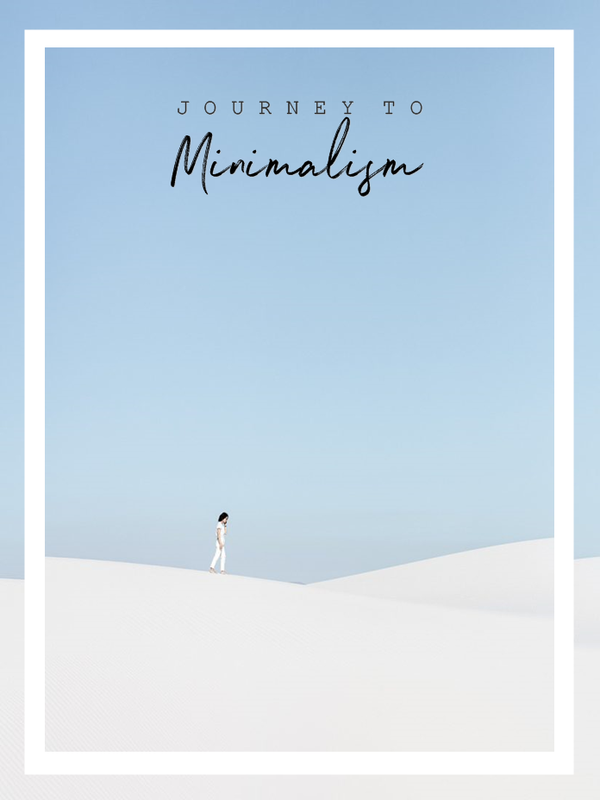 I agree on trying to be minimal at this point. Bringing lots of stuff in our bag is just such a hassle and all. Assalamu Alaikum! That's great, and I'm glad you got some tips from me. Good luck and study well. Assalamu Alaikum. Ahw thank you so much. I do love my bag too. Loved reading this! Great post, I love the background of your phone! So cute! Thank you, Monique! Haha yes, donuts is my forever, lol. Haha! It's alright, we all do it sometimes. Ahw that's great. Looks like you have all of the essentials and I am SOOOO in love with your makeup bag!!! Please tell me where you got it, as I totally need it in my life! Ahww, I know it's the cutest. I wish I could just send you one. Thank you, Aimee. That's great! Loved this post and also insightful to know that coins and cards should be kept in different purses for convenience reasons in the Philippines! Thank you. Yeah, that's Philippines. Your cosmetic bag is so cute, where did you get it? And not wearing makeup saves you a lot of time! When I was younger I applied a full face of makeup everyday and now that I'm older I just can't be bothered haha. Ahw thank you, just here in the city's downtown. Yes it does especially when I'm running late. Ahww that's alright. I have all of those in my bags plus more! Man, I miss being a college student! 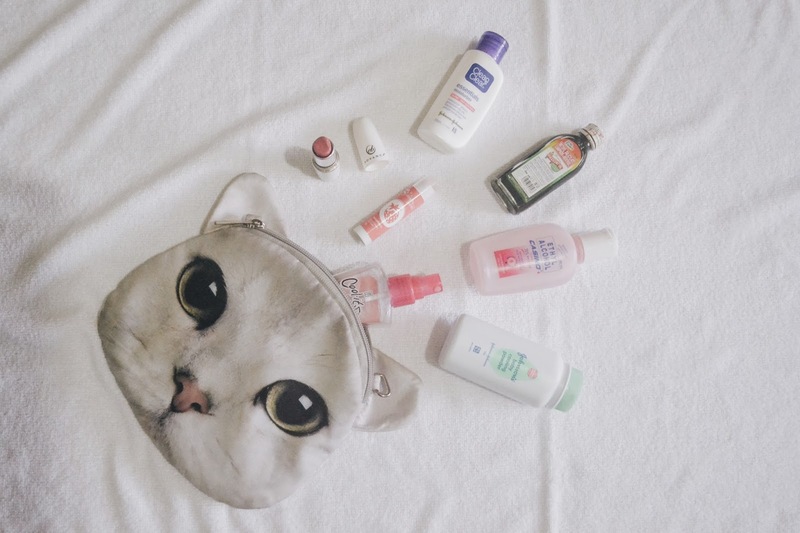 That cat bag is SO cute! That bag is the cutest thing! I just came across your blog and you write so well. I love the bag you have here. Very cute chic! Very useful post. I also did a whats in my uni bag post a few weeks ago. Love ur hygiene kit bag. Its so cute. Check out my creative lifestyle blog.